China's Belt and Road Initiative. Big hopes, big fears. China is bringing the economies of Europe, Africa and Asia closer together with the century's largest infrastructure project. 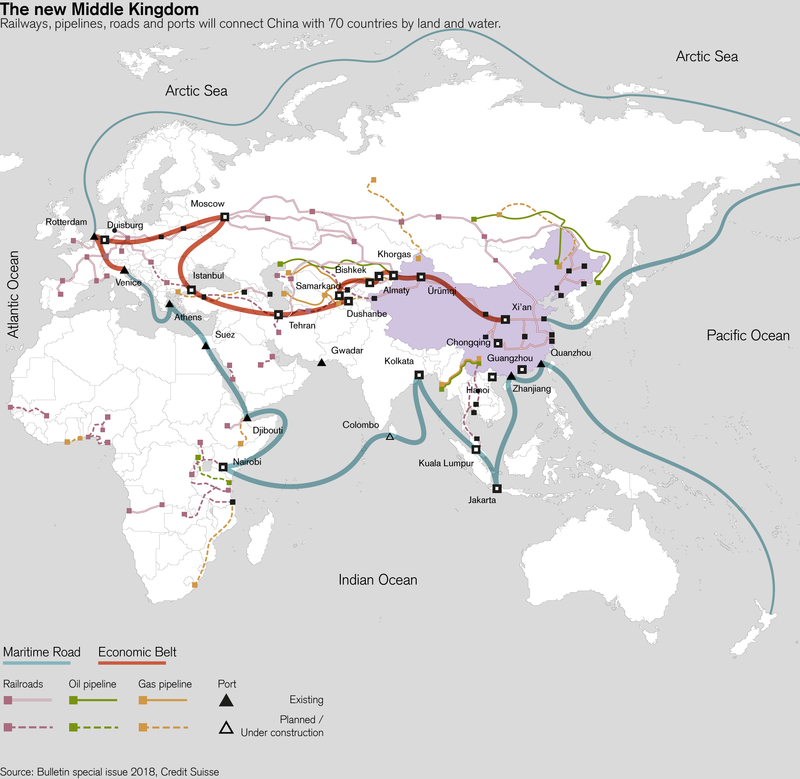 The New Silk Road may bring a surge in growth – and it's inspiring hopes and fears alike. The world is watching the progress of the century's largest infrastructure project – officially titled the Belt and Road Initiative (BRI) – with hope, envy, admiration and fear. It is a visionary undertaking that will connect the national economies of dozens of countries between China and Western Europe. It was only five years ago, that President Xi Jinping first proposed reviving the ancient Silk Road. Already in the second century BCE, China used this network of trade routes to conduct business with the Roman Empire across more than 6,000 kilometers. "We want to unite the world with common values and ideas," Xi said. China would build modern infrastructure in the underdeveloped states of Central Asia in order to connect western Europe with the eastern coast of China and to provide new opportunities for people who live between the two Eurasian centers of power. Read the Bulletin special edition "Courageous decisions"
Since then, the BRI authority in Beijing has expanded its sphere of influence so widely that even experts can hardly determine where the initiative begins and where it ends. Take the overland Economic Belt. This new group of modern railway corridors, stretching for tens of thousands of kilometers across Eurasia, has the potential to shift economic and geopolitical power relations fundamentally over the next 50 years. And then there is the Maritime Road, which is supposed to expand international sea trade. A chain of ports will connect the Chinese coast with Athens and Venice, by way of Hanoi, Singapore and the Kenyan city of Mombasa. The ten largest container ports in the world are located along this route. So far, China has kick-started 900 billion dollars' worth of projects through the China Development Bank and the Silk Road Fund. It's impossible to estimate how much China will ultimately spend on the BRI – one trillion dollars, or eight? Sympathetic observers rave that China is selflessly bringing progress and prosperity to underdeveloped countries. Critics – including US secretary of state Mike Pompeo and French president Emmanuel Macron – see the BRI as a broad assault on Western values that aims to disrupt geopolitical power relations, transform as many nations as possible into Chinese satellite states and establish the renminbi as a key currency. But in order to understand China's motives for the belt initiative, we must first look within the country itself. Xi Jinping has brought China's development goals forward by 50 years. By 2021, no Chinese citizens are supposed to be living in poverty. And China has learned that nothing promotes economic and social development more enduringly than effective, modern infrastructure. The economists from Credit Suisse Research also presume that the initiative will unleash a surge of growth. Over the next five years, they estimate that the infrastructure project will boost the GDP of involved countries by an additional 4 percent – or around 240 billion dollars. Pakistan has planned more BRI projects than any other country – bridges, roads, power plants, ports and railways totaling 62 billion dollars. Thanks to the Chinese, Pakistan is experiencing a powerful leap in development and economic growth that will reach 6 percent this year. But at the same time, government debt has risen by one-third, to 70 percent of gross national product (GNP). According to the Center for Global Development in Washington DC, Pakistan is one of eight nations now on the brink of insolvency because of costly BRI credits – alongside Mongolia, Sri Lanka, Tajikistan, Kyrgyzstan, Montenegro, Laos and the Maldives. Fearful of taking on too much debt, Malaysia recently suspended projects for two gas pipelines and a railroad, which would have connected the country's eastern and western coasts. Christine Lagarde, Managing Director of the International Monetary Fund (IMF), recently warned China against financing unnecessary and unsustainable projects in countries with a high debt burden. But the selection of projects has often been difficult to comprehend – including a highway to nowhere, which has plunged Montenegro into a debt crisis, and bridges on the Maldives that will be underwater within a few decades. So far the BRI authority has not published any cost-benefit calculations, and there are also no official tendering procedures. The European Union and United Nations regularly complain that the criteria for lending are not transparent. And, as always with billion-dollar projects, corruption is a fundamental risk. In the end, the success of the Belt and Road Initiative will also depend on how well China manages the political disputes that the initiative has created. India has withdrawn from all BRI projects because the new Pakistani corridor runs through a part of Kashmir that India claims for itself. India is likewise skeptical of Bangladesh's participation in the BRI, which began in October. A port and airport complex in Sri Lanka is especially problematic. Sri Lanka was not able to service its billion-dollar BRI loan, and it signed over the complex in Hambantota to two Chinese state-owned companies. India's fear is that a military base could be built there. Ironically, China will be able to acquire greater global influence precisely because of the withdrawal of the United States under Donald Trump from the Trans-Pacific Partnership free trade agreement. In February, 33 Latin American countries announced their intent to join the BRI. The Chinese have promised to orient themselves more closely towards Western lending practices and to award more contracts to local companies. During the construction of a railway line from Nairobi to Mombasa, for example, the Chinese hired 25,000 Kenyans; the Chinese operating company is training dozens of Kenyan locomotive operators. If the Belt and Road Initiative leads to more such projects, it could become an international success. This is a short version of an article by Lars Jensen. For the full article download the latest edition of Bulletin called "Courageous decisions". Is active China's Belt and Road Initiative. Big hopes, big fears.